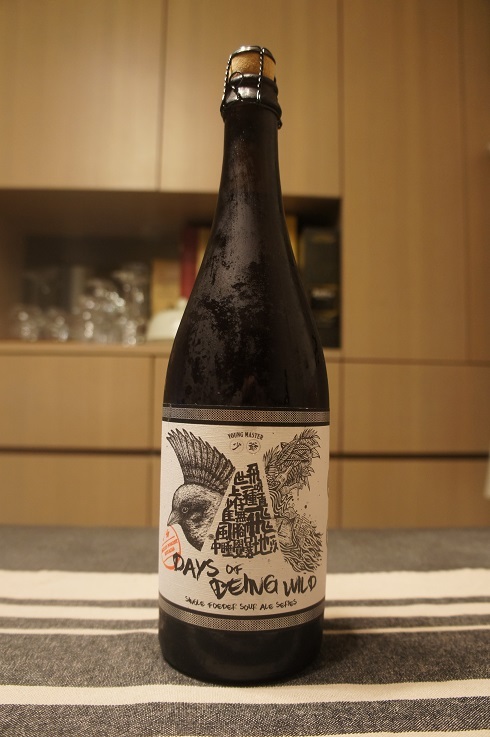 Brewer Description: (from website) Inspired by the tradition of lambic style brewing in Belgium, this is the first mixed fermentation program of its kind in Asia. With a mixed-culture fermentation featuring a medley of wild yeast and bacteria strains, these beers have haunting complexity, natural farmhouse funk and refreshing fruitiness. We plan to release variations every couple of months. With our single-foeder sour ale as the base, we blended in a medley of mixed forest berries and fermented it a second time in brandy barrels. Intense berry flavors combined with funk and acidity from the base beer makes it incredibly complex, yet extremely refreshing. Intro: A 750ml bottle, 2017 vintage, bottle 160 of 250. Poured into a 3 Fonteinen stemmed glass. Appearance: A nice clear ruby red colour with a big two finger pinkish head that dissipated fairly quickly to a small ring around the glass that keeps replenishing with lots of small bubbles, while leaving only sparse lacing. Aroma: Mixed berries, raspberry, strawberry and blackberry with mild tartness and light funk. Taste: Mixed berries, mainly raspberry and blackberry, there’s also some oak, lightly sour and light funk. Overall: Good berry aroma and flavours although the berry flavours end a little abrupt. Still though, it is well worth a try.